There’s an easy way to find oil. Go to some remote and gorgeous natural sanctuary, say Alaska or the Amazon, find some Indians, then drill down under them. If the indigenous folk complain, well, just shoo-them away. Shoo-ing methods include: bulldozers, bullets, crooked politicians and fake land sales. But be aware. Lately the Natives are shoo-ing back. Last week, indigenous Peruvians seized an oil pumping station, grabbed the nine policemen guarding it and, say reports, executed them. This followed the government’s murder of more than a dozen rainforest residents who had protested the seizure of their property for oil drilling. In the 1980s, Charles Koch was found to have pilfered about $3 worth of crude from Stanlee Ann Mattingly’s oil tank in Oklahoma. Here’s the weird part. Koch was (and remains) the 14th richest man on the planet, worth about $14 billion. Stanlee Ann was a dirt-poor Osage Indian. Then there are the Chugach Natives of Alaska. The Port of Valdez, Alaska, is arguably one of the most valuable pieces of real estate on Earth, the only earthquake-safe ice-free port in Alaska that could load oil from the giant North Slope field. In 1969, Exxon and British Petroleum companies took the land from the Chugach and paid them one dollar. I kid you not. Wally Hickel, the former Governor of Alaska, dismissed my suggestion that the Chugach deserved a bit more respect (and cash) for their property. “Land ownership comes in two ways, Mr. Palast.” explained the governor and pipeline magnate, “Purchase or conquest. The fact that your granddaddy chased a caribou across the land doesn’t make it yours.” The Chugach had lived there for 3,000 years. Some Natives are “re-located” through legal flim-flam, some at gunpoint. The less lucky are left to wallow, literally, in the gunk left by the drilling process. Take a look at this photo here, taken in the Amazon rainforest in Ecuador. It’s from an investigation that I conducted for BBC TV, now in the film “Palast Investigates.” I’m holding up a stinking, black glop of crude oil residue pulled from an abandoned Chevron-Texaco waste pit. 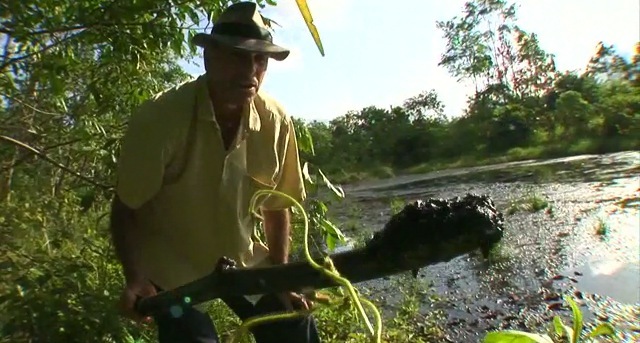 A pipe runs from the toxic pit right into the water supply of Cofan Indians. After drilling began, Criollo’s son went swimming in his usual watering hole, came up vomiting blood, and died. I asked Chevron about the wave of poisonings and deaths. According to an independent report, 1,401 deaths, mostly of children, mostly from cancers, can be traced to Chevron’s toxic dumping. Big Oil treats indigenous blood like a cheap gasoline additive. That’s why the Peruvians are up in arms. The Cofan of Ecuador, more sophisticated, and less violent, than their brothers in Peru, have taken no hostages. Rather, they have heavily armed themselves with lawyers. But Chevron and its Big Oil brethren remain dismissive of the law. This week, Shell Oil, to get rid of a nasty PR problem paid $15 million to the Ogoni people and the family of Ken Saro-Wiwa for the oil giant’s alleged role in the killing of Wiwa and his associates, activists who had defended these Niger Delta people against drilling contamination. Shell pocketed $31 billion last year in profits and hopes the payoff will clear the way for a drilling partnership with Nigeria’s government. Congratulations, Shell. $15 million: For a license to kill and drill, that’s quite a bargain. This weekend on Air America Radio, catch Greg Palast on the oil wars on ‘Ring of Fire,’ hosted by Mike Papantonio and Bobby Kennedy Jr.
Father’s Day is coming up. Isn’t it time you told Dad the truth? And no one tells the truth with more info-fueled flare than Greg Palast (“A cross between Seymour Hersh and Jack Kerouac.” – Buzzflash). Get dad a signed copy of Greg’s new DVD, Palast Investigates: From 8-Mile to the Amazon, for a minimum tax-deductible donation of $40 to the Palast Investigative Fund, a 501c3 educational foundation. Include your dad’s name, and Greg will personalize it. The film gives you Palast’s latest reports for BBC Television and Democracy Now! – including a ride up the Amazon to the Cofan village; then back to New York’s Lower East Side where the reporter shows how the investigations are done. Presented by Air America Media. Your donation supports this important work. Forget the ties and stop the lies – Palast Investigates. “Stories so relevant they threaten to alter history.” (Chicago Tribune.) “The All-Time Greatest Moment in [Film] History.” – Op-Ed News.